Light whipped ganache, which I think of as the ultimate chocolate whipped cream, is the most cloud-like and lovely chocolate frosting imaginable. Compared to classic dark chocolate ganache, which uses about equal weight chocolate and heavy cream, light whipped ganache uses double the weight of cream to chocolate. It's easy made by processing the chocolate until fine particles and adding the heavy cream that is brought to the boiling point with the motor running. After it cools to around 65˚F/18˚C it is whipped to a mousse like consistency. Not only is it perfect for frosting a cake, it also makes a perfect chocolate mousse dessert. 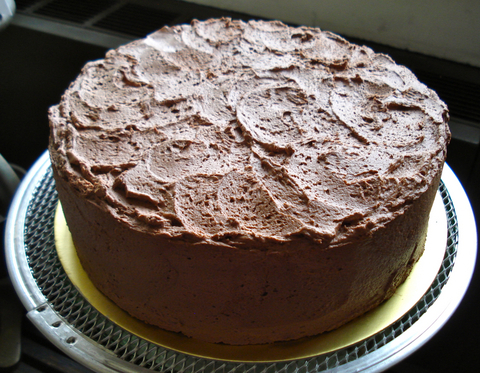 The photograph above is of a chocolate chiffon cake which I made for an Epiphany party. You can see the airy consistency of the chocolate whipped cream. Everyone was amazed that even a large serving was so very easy to eat!